A bunch of people have emailed or commented here with things that they think I should be checking out. They’re probably right. However, I’m short on time, and working on a project heavily at the moment, so if you’re waiting on an email from me, please be aware that I probably saw it, I just haven’t gotten around to actually answering everything yet. I’ll get back to you soon, I promise. About 6 months ago, when I was trying to kickstart the Open Guide to Boston project, I mapped out each of the stations on the subway lines in Boston by hand, by looking up the info on the MBTA website, and hand clicking on a satellite map, in an effort to avoid concerns of copyrighted material making it into a CC-licensed dataset. I later learned several things that frustrated me, such as the fact that there’s no database protection in the United States like there is in the UK, so a collection of the location of T Stops is just a collection of facts, and is not copyrightable — although a particular representation of those may be copyrighted, for example, the display of them on a Google Map in a specific way. However, this was not the most frustrating event. The most frustrating thing that happened with regard to all the manual labor I put into it is that there was a much easier way: The state government of Massachusetts posts all its data under an open license, allowing for free reuse (with source credit). This includes, amazingly enough, a full listing of all the T Stations, including their name, what line they’re in, and their geographic location. Yeah. Those 6 hours I spent could have easily been compacted into one without a problem, with more accuracy, and with nicer results. There would have been no copyright concerns, and I could have done it entirely with free software. I made the same mistake that many neogeographers are making, over and over again: Thinking I was doing something new. The idea that there might be information out there which could make my life easier never crossed my mind. 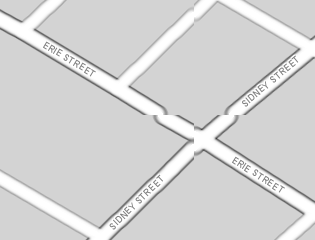 Researching the standard GIS formats, and how to work with them, meant nothing to me: I seriously thought ESRI Shapefiles were a proprietary format that no one would know how to do anything with. Hell, I took at look at them at one point, and couldn’t figure them out because they didn’t return anything useful via `cat`. A lesson here? Learn the tools of your trade. Every neogeographer should take a lesson in what ‘ogrinfo’ does. Look up information from your local planning board: See if they post files online. See what data is available for you to play with. See if maybe you can save yourself a bit of work by taking what already exists, and not doing the same work by hand. Because there’s a lot of geographic information out there, and recreating it all yourself is not really worth the effort. GIS is a big field. Neogeography is the cutting edge of it, but right now so much of it is about reinvention of the wheel. There are solved problems that keep getting resolved with every new web mapping API. Learn from others mistakes, and use what they provide to you, and you may end up saving yourself a lot of work. I know I could have. I’m not busy, and have some interesting stuff to talk about this Friday, so I’ll be leading a meeting of the Geomancers Geo Interest group this Friday, May 5th, from 5pm-7pm at the Muddy Charles Pub, located just inside 142 Memorial Drive in Cambridge. Anyone is welcome to come by: Bring laptops, and you can get online via MIT’s network, bring cash (no cards!) and you can grab a drink — beer or soda. I’ll try and grab us two tables, since last time we kind of overflowed the one we had. Mapping is fun. Picking out the way things should look, when information should be displayed, what info should be on a map — it’s pretty nifty. Looking at the various resolutions of data, making rendering decisions based on time and quality of data needed at that level… it’s nifty. Schuyler and I have been working with the Openstreetmap data, trying to figure out how to make a fast WMS server available. Seems like we’re getting pretty close now: generating various levels of polyline simplification ranging in degree, giving a set of 5 layers to be used at scales ranging from above 3 million all the way down to 20,000 without significant loss of data, then displaying the full quality data below that. GRASS is being used to create the polylines and clean the data, and I’m using qgis to view the different layers. qgis, btw, is a great little GIS program for testing out various layer files you might find on the intarweb. It’s a bit slow for huge (dozens of thousands) numbers of polylines, but for most purposes, it’s great, has nice zooming features, and lets you check out some of the fields that are stored in a file without having to resort to things like ogrinfo. All in all, I like this mapping stuff. Now, I need to figure out how to make money doing this. You are currently browsing the Technical Ramblings weblog archives for May, 2006.